Kindergarten teacher Stephanie Carson reads to her class during a typical day at Bright Elementary School. Carson is one of four kindergarten teachers at Bright Elementary that try to impart to her students the love of and importance of reading. The term “foreshadowing” suggests a larger event or twist of fate that will happen later in a book, movie or life itself, and for two women that grew up in Mowrystown and McConnelsville, the influence of a teacher will lead to a special free book fair at Bright Elementary School on Friday, May 10. Bright Elementary Principal Michael Bick told The Times-Gazette that anytime something nice comes along for the children that he and his staff shepherds, he’s all for it. The inspiration for the book fair came from an aunt who was both a teacher and a librarian, according to Laura Gilbert, who along with her husband Josh and Mowrystown native Leah Neal created the Foreshadow Foundation. Both she and Neal came from small school districts in rural Ohio, became the best of friends when they attended Marietta College nearly 10 years ago, and remembered the small gestures of caring teachers that guided them early in life. What became known as the Blythe Schubert Memorial Book Drive eventually materialized into a major effort between the three friends with the goal of raising one book for every student in prekindergarten through sixth grade in Morgan County, so that on the last day of school every student could have a book of their choice to take home. Neal said that growing up there wasn’t a lot of money in the household, but she has fond memories of a teacher who made sure she had plenty of books to read over the summer. For a little girl attending third-grade at the old Belfast school, it made a lasting impression. ● Students who don’t read proficiently by third grade are four times more likely to drop out of school. ● Two-thirds of students who can’t read proficiently by the end of fourth grade will end up later in life either being incarcerated or on the welfare rolls. ● One-quarter of all children in the U.S. grow up without learning to read. ● Sixty-one percent of low income households don’t own any children’s books. She said the Foreshadow Foundation was born from the idea that every child deserves to have free access to books of their own, and built upon the simple premise of selecting an elementary school from a rural part of the country to partner with. The same place where Neal’s passion to read and learn was born, ended up being selected as the organization’s first partner school, she said, and the book fair coming to Bright Elementary School will allow students to pick out a book that interests them and take it home free of charge to have and read over the summer. 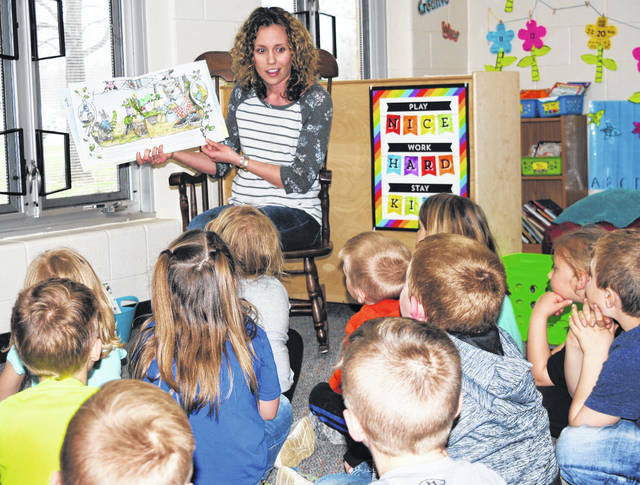 She said that their organization is now working with larger publishing companies like Scholastic and Random House, so that the book fair concept will become an annual event at another rural elementary school like Bright Elementary next year. The non-profit organization accepts donations through its Facebook page and through the website’s PayPal link. Those wanting to support their efforts can link directly to the foundation’s Amazon Wishlist to purchase books that will be sent directly to the organization. They can also be found on the internet at www.4shadow.org, and donations for the Bright Elementary and future book fairs can be mailed to Foreshadow Foundation, P.O. Box 531776, Livonia, Mich. 48153.